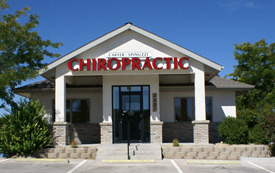 Looking for a chiropractor in Pueblo? Our chiropractic website is especially designed for health-conscious folks in Pueblo, Pueblo West & Pueblo County. Chiropractic helps neck and back problems and also a variety of organic and systemic problems. We attempt to make chiropractic care in our office convenient, comfortable and affordable while at the same time effective in reaching a positive outcome. We have great success in treating neck and back pain, headaches, arm and leg pain and many other musculo-skeletal conditions. Find out why other Pueblo-area residents prefer the chiropractic care that we provide at Carter/Spinuzzi Chiropractic. Call our Pueblo chiropractic office to arrange a consultation today and find out if you’re a good candidate for today’s chiropractic care! Very nice – took the time to explain. Thank you for giving me hope that I can feel better! So grateful for such a caring staff. Easy check in and very receptive and gentle doctor. Thank you so much!